Quiet, powerful, convenient and clean, Electric Vehicles (EVs) are going mainstream. Leading the way is the Tesla Model-S which is one of only two cars to receive the highest rating given by Consumer Reports. It also boasts some of the fastest 0-60 mph acceleration numbers available in production autos. The affordable Nissan Leaf leads in popularity with worldwide sales of over 100,000 units. From BMW to Ford, the major auto makers are joining the EV club. In addition to low emissions, the EV’s growing popularity is undoubtedly due to its convenience. EVs like the Leaf are particularly well suited for commuting. Upon arrival home, the driver simply takes a moment to plug it in and they are assured a ‘full tank’ in the morning. With the majority of households owning more than one vehicle, people are recognizing the value of making one of them an EV. The EV is ideally suited for quick trips around town and the economically draining single driver commute. Consider the common suburban family constellation of two working parents and two children. Often one parent works some distance from the home and the second closer to home or part time. 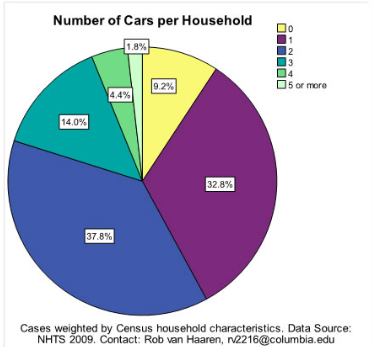 These households often have 2 – 3 cars. One is a smaller commuter and weekend errand vehicle while the other serves as the family taxi and long trip mini-van or SUV. This and similar situations are typical of millions of households. It is a very fast paced, highly scheduled lifestyle. Anything that reduces surprises and out of the routine events is of high value. With its low maintenance and ability to ‘refuel’ overnight at home, the EV is an excellent fit for many modern households. No waiting in rush hour gas lines during the Friday commute home, no ICE (Internal Combustion Engine) range anxiety with the fuel light on solid red. The stressful commute spent wondering whether to buy gas only to have to make the left turn through rush hour traffic or hope to make it home and buy it on the weekend. No wasting precious weekend family time making the special trip to the filling station. No fouling up the fine tuned schedule with that oil change every 3 – 4 weeks. The EV eliminates it all. In this and many ownership scenarios the EV is not simply a comparable solution but, rather, a better one. There is an odd meme making the rounds in which EVs are disparaged because the typical EV has less range than a traditional ICE vehicle. The myth of ‘range anxiety’ is subtly perpetuated in the mainstream media. Typically there is a glowing piece that talks about the EV as if it is a novelty and then frames the report with something about the low range and the ‘anxiety’ it causes. Often they will then point out that for long trips the EV cannot be used since recharging is time consuming and impractical. And generally, either overtly, or covertly through inference, the viewer or reader is steered towards the conclusion that EVs are not quite ready for ANY application. Until they can take those once-a-year long road trips, the meme suggests, EVs are just not yet useful or practical. While this is a valid argument when it comes to replacing the car used for long trips, it is simply irrelevant when it comes to the commute / around town car. Its kind of like telling a mechanic that their screw driver is worthless because it cannot turn a hex bolt. Its true if you are trying to turn a hex bolt but if you are trying to turn a screw then the screw driver is the tool of choice and the socket wrench becomes useless. Given the important environmental role that EVs can play, it is important to re-frame the discussion honestly and acknowledge that for millions of potential customers, EVs are already the best transportation solution. In many situations EVs are more convenient and create less anxiety than ICE vehicles. In other words for two and three car households, EVs are not just the equal but actually the better solution for the commuting / errand car. 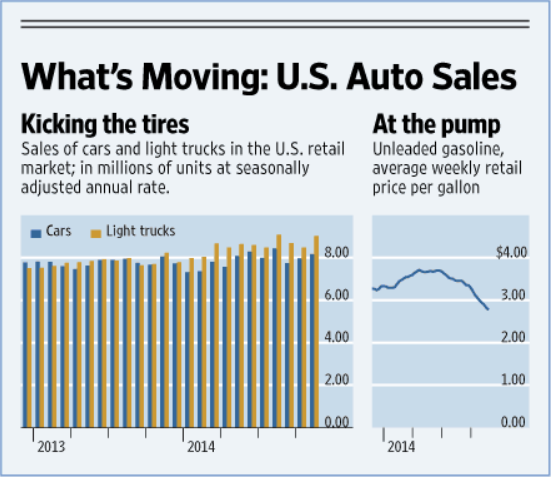 Each year there are about 17 million autos and light trucks sold into the US market. Well over half of these are sold to multi-vehicle households. In a typical two car household one vehicle is used for commuting, around town errands and the other is used for most of the other tasks including long trips. The typical commute is a well defined distance. As a result it is easy to figure out whether the EV is suitable for the job. According to Consumer Reports, the Nissan Leaf has a range of about 75 miles. 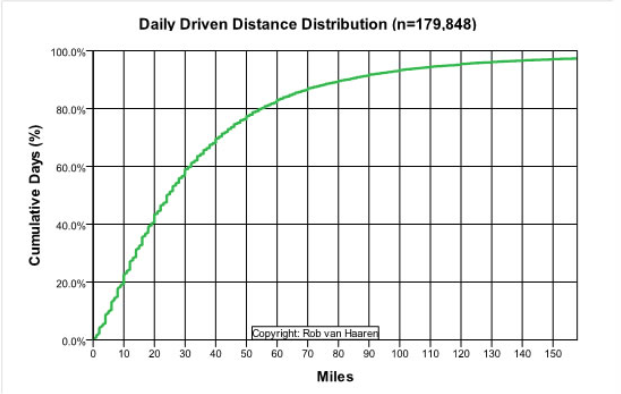 In the graph above by Rob van Haaren, it is clear that cars are driven less than 60 miles per day about 80% of the time. 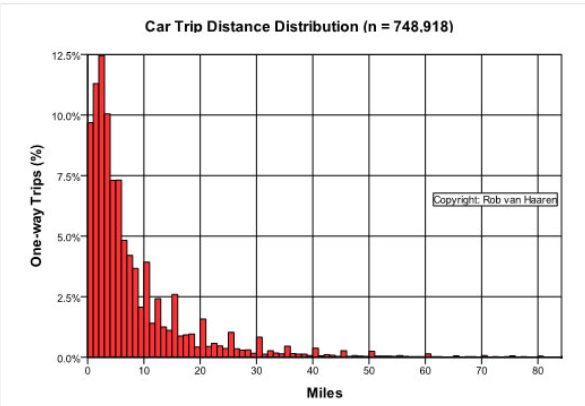 The graph provides per car statistics. In 2 and 3 vehicle households the longer trips can easily be accommodated using the ICE vehicle. By doing so the percentage of ‘close to the margin’ imposed on the EV becomes even lower or can be eliminated all together. It is a perverse and suspect notion that EVs are not ready for the mainstream. The flawed reasoning goes something like this; EVs are not a good option for long trips therefore they are not useful at all. Consider that, for over 10 years, the Toyota Camry has been the best selling car in the US. To hold this crown the Camry has only required about 2.5% market share. According to the strange ‘logic’ of EV detractors, Camry is a failure. Or, stated in a different way: Camry has 2.5% market share therefore 97.5% of purchasers found preferable solutions so Camry cannot be a mainstream vehicle. A product can be mainstream without being the only or even the primary one in its category. Nobody would deny that Camry’s are mainstream. But they are not the only vehicles sold nor do they constitute a majority of the vehicles sold. They serve a specific market and they serve it well. Similarly EVs such as the Nissan Leaf and Ford Fusion already have a large addressable market today. That addressable market will only expand as battery prices drop, range increases. As a hint to the near future jump in range of EVs one need look no further than the Tesla Gigafactory. It is designed to produce 50 GWhr of battery packs per year. Tesla claims that will be sufficient for 500,000 vehicles per year. That comes out to 100kwhr of battery per vehicle. The Model S, a large car, gets over 250 mile per charge on their 85kwhr battery. This suggests that rank and file EVs will be sporting ranges of over 300 miles per charge by 2020. EVs are clearly going mainstream now and their addressable markets are expanding at an astonishing rate. However as the Tesla Supercharger network expands, the Gigafactory and its inevitable competitors come online, and methods for faster charging are perfected, it may well be a mere 5 years before ICE vehicles really are obsolete. I want to acknowledge Rob van Haaren for his work making data from the Federal Highway Administration‘s National Household Travel Survey (NHTS) accessible to a wider audience. For his report Dr. van Haaren mined NHTS data for information relevant to electric vehicle use and presented much of it in helpful graphical format. Graphics with his name are protected by copyright and used with permission. This Link takes you to the dot (Dept of Transportation) page that shows total vehicles on the road. This blog has compiled data on BEV and HPEV sales. EV Range is set to increase dramatically by 2017. Tesla Range – This is a spreadsheet with charts showing the battery performance across many Tesla users: Wow! Elon Musk is blessed with some wonderful Early Adoptors! This entry was posted in EV PEV, New Energy Paradigm and tagged EV, PEV. Bookmark the permalink.